The CE-1 universal cell is used to perform back and forward extrusion, compression and resistance to flow tests. The fixture consists of a cylinder, a close-tolerance piston, a back-extrusion piston, an extrusion grid base, three orifice bases and a solid base. 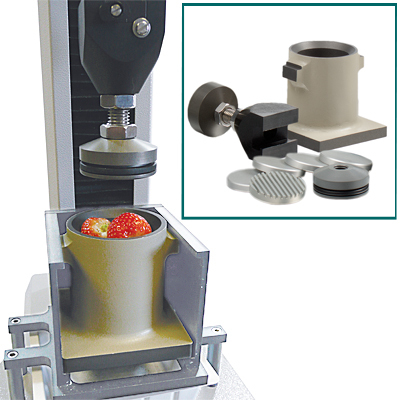 The sample containment cylinder has a diameter of 2-1/4 inches (57 mm) and is 3 inches high with a volume of 11.9 cubic inches (195 ml); a ridge is formed near the bottom of the cell to support the inserts. The close-tolerance piston has a diameter of 2-1/4 inches and is used in forward extrusion methods when paired with the one of the orifice plates or the grid base disc. The extrusion grid base has eleven (11) 0.095-inch, parallel slots. 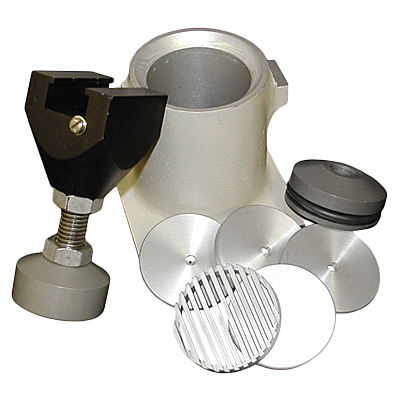 The back-extrusion piston has a diameter of 2 inches (51 mm) and is used with the solid base. Each of the orifice base plates has a different sized circular hole, the diameters being 0.062 inches (1.6 mm), 0.031 inches (0.8 mm) and 0.015 inches (0.4 mm). This fixture is suitable for bulk analysis methods. Fruits grading and selection tests for puree. Flow, cohesiveness, yield point, coating properties, pumpability of dips, spreads, sauces, etc. Viscosity effects and flow evaluation for tomato products, mayonnaise, rehydrated potato flakes, peanut butter, sugar syrups, etc. Test cell for back and forward extrusion. Consists of 57mm diameter cylinder with slotted, solid and drilled base plates, with 57 and 51mm diameter pistons. Recommend for use with 1000 and 2500N load cells with dovetail adaptor. Maximum rating of 500 N dependent on loadcell.